ClearGov launches new budgeting and forecasting solution to compliment transparency platform. Maynard, MA (9/20/18) – ClearGov, a leader in municipal technology, announced today a new product that streamlines the budget-building process for local governments and school districts and allows them to more accurately and easily forecast expenses and funding. Designed in collaboration with existing ClearGov customers, the sophisticated, yet simple platform was built in response to the ever-evolving demands of the public sector to enhance antiquated systems and drive efficiencies. ClearGov BudgetsTM allows municipal officials to quickly and easily create, share and review their budget via a web-based portal. Innovative collaboration tools give administrators the ability to easily communicate with department heads on budget requests; accept or deny requests; and manage and track feedback. The platform gives internal stakeholders more visibility into the entire budgeting process; saves time and effort; and mitigates the human error that can happen when trying to collaborate across multiple spreadsheets. Additionally, ClearGov BudgetsTM includes a sophisticated forecasting tool that allows local municipalities to gain a clearer picture of future expenses and funding in order to make more informed budgetary decisions. The forecasting tool goes beyond traditional regression-based forecast analyses by utilizing a type of neural network used in deep learning systems, to automatically generate accurate forecasts based on current and historical internal budget models. 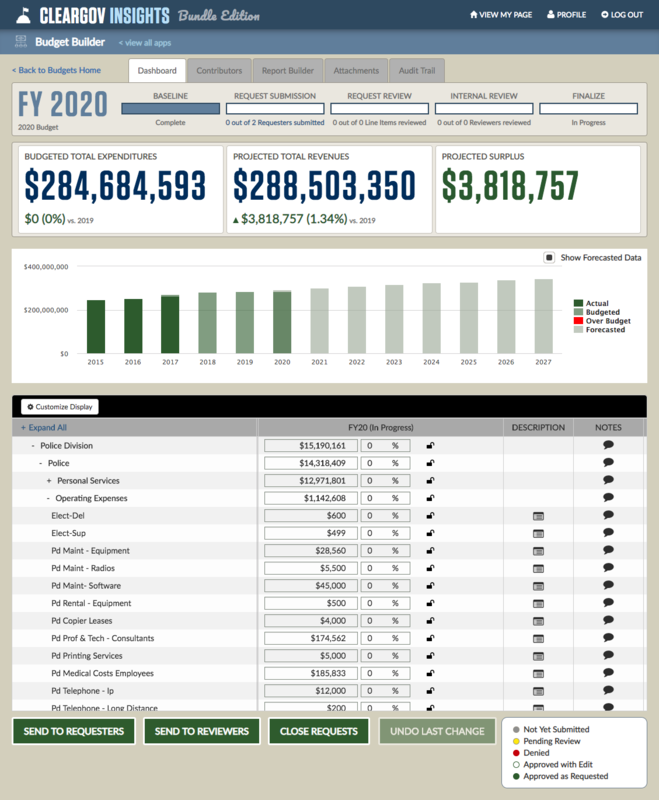 ClearGov BudgetsTM also features a digital audit trail that is automatically created and updated whenever changes are made to the budget; the ability to create and export reports for print or digital budget books; and a document repository that enables users to easily access any supporting documentation for individual budgetary line items. ClearGov is a leader in government transparency and benchmarking solutions and works with hundreds of local governments and school districts in 20 states across the country. The Massachusetts based startup recently raised a round of seed capital and has consistently grown their customer base 350% year-over-year. The addition of BudgetsTM to ClearGov’s suite of innovative municipal solutions is the next step in ClearGov’s mission to build a community of transparent, data-driven, modern governments. 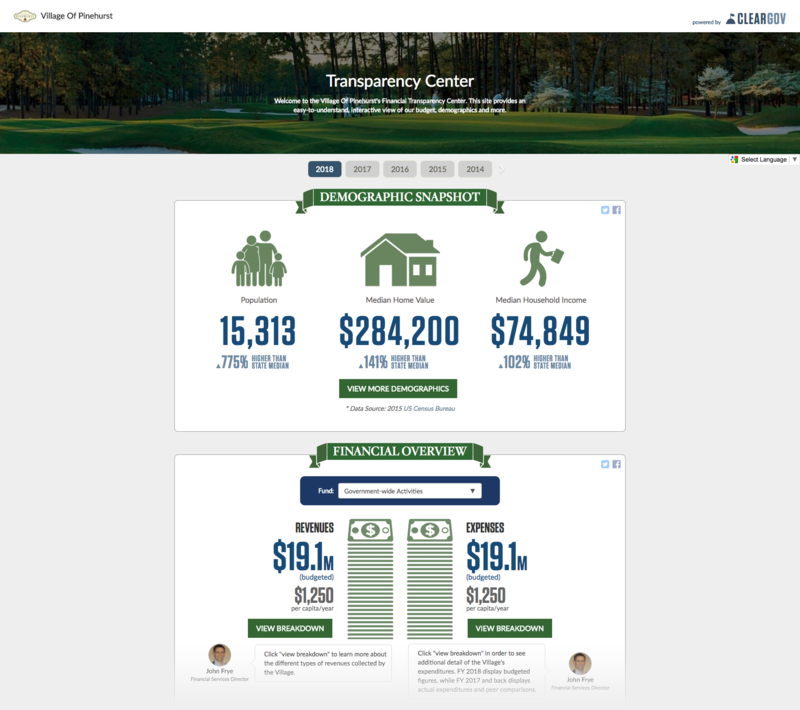 To explore ClearGov’s local government budgeting dashboard visit www.cleargov.com. 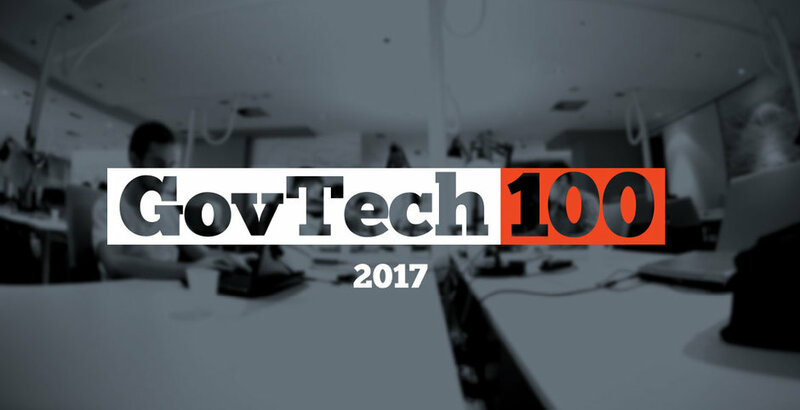 ClearGov is building a community of transparent, data-driven, modern governments. ClearGov drives this mission by offering a suite of SaaS solutions for town, cities, schools and other municipal entities that includes transparency, benchmarking, budgeting and forecasting solutions. ClearGov’s award-winning platform is utilized by hundreds of communities across twenty different states. Maynard, MA (5/8/18) – ClearGov, a leading municipal transparency and benchmarking platform, today announced an artificial intelligence platform to more accurately and automatically compare finances across municipalities. The new technology helps local governments benchmark spending and funding across a state and national standardized chart of accounts developed by ClearGov. In response to this problem, ClearGov has developed an artificial intelligence platform that can ingest government agencies’ raw accounting data and automatically translate it into a standardized chart of accounts. The platform analyzes many elements of the accounting data, including accounting ID structures and line-item keywords, to accurately restructure the data. By automatically placing similar accounting line items in like categories, the system produces truer “apples to apples” financial comparisons across municipalities. Government clients of ClearGov’s Insights platform can utilize this standardized accounting structure in a series of custom benchmarking and analytical tools. For example, the platform can inform a town how its spending on “Snow & Ice Removal” compares to other towns with similar road miles in a given proximity. The peer-to-peer comparisons are also utilized in a public-facing transparency profile to provide context that help bring a town’s financials to life for everyone in the community. ClearGov’s new artificial intelligence platform also dramatically reduces the time needed to onboard new clients’ data on to its transparency and benchmarking platform. A process that was measured in days now takes minutes to analyze and categorize new clients’ data allowing clients to get up and running quickly. We are excited to announce that ClearGov has been nominated for the 2018 New England Innovation Awards. 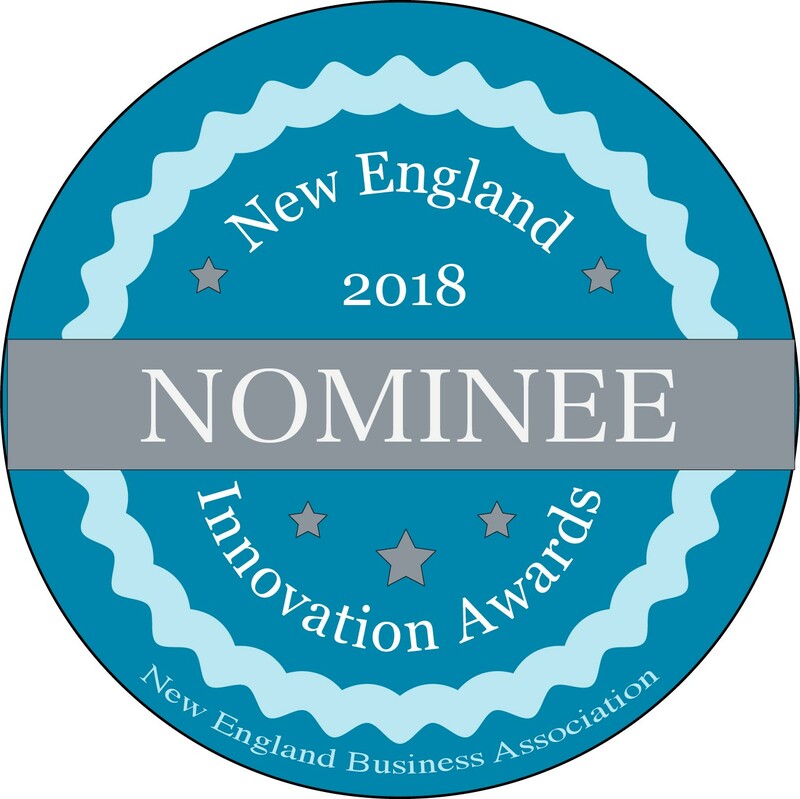 Established in 1986 by the New England Business Association, the Innovation Awards recognize those companies that have transformed their innovative ideas into a product or service that delivers proven value to customers. The Program has recognized almost 200 companies from a wide variety of companies in fields such as technology, manufacturing, service, non-profit, and retail/distribution. The New England Business Association has selected 200 local companies for consideration and will be announcing 20 finalists on mid-April. The 20 Finalists will each have 3 minutes to present to the entire group of judges, our Partners, our Board members, and other invited guests. The Gala Awards Presentation and Dinner will be held in early May where the winners will be announced at a formal dinner presentation.